A couple of months ago, I made another trip out West, and visited Dry Creek Valley for the second time this year. The first time around, it was all new to me–sure, I had driven through Healdsburg and Geyserville before, but I had never really experienced the Valley as a cohesive entity. This second visit, had a different feel altogether–I was already familiar with the basic geography, had visited some of the wineries, and had met a few of the wonderful people in Dry Creek. Thus, the second go around was less about learning the unknown than supplementing the familiar. Sure, I visited a few more new (to me) wineries (Nalle, Frick, and Estate 1856), but one of the great aspects of revisiting wine regions is checking back in on some of the people whom you had previously met. On my second trip, my first night there, I was invited to a dinner at the beautiful home of Nancy and Greg Chambers, at Kachina Vineyards. There were several other wine people there, and thus tons of wine. Since it was a social event, I decided ahead of time that I would not be taking any notes on the wines–I guess nobody would have minded, but I already have enough trouble overcoming my inherent geekiness, so I opted to leave the notebook closed. Regardless, I was particularly impressed with both the Kachina Chardonnay and the Charbono, but I have to say I was also fixated on the magnum of 2003 Pasterick Syrah. On my previous trip to Dry Creek, I spent quite a bit of time with Gerry Pasterick, talking wine, cracking jokes, and avoiding politics. I briefly visited him at his fantastic wine cave while out on a bike ride, and sat next to him at dinner after an epic wine tasting. This time, however, was the first time I met his lovely wife Diane, and, as I am sure I am not the first to wonder how Gerry was able to convince Diane to marry him (not really, but it was a frequent topic while I was there, and a way to trigger Gerry’s infectious laugh). 2013 Vineyard of Pasterick Rosé of Grenache: Retail $24. 130 cases made (only available through the Wine Club). The fruit, picked at 20 Brix for the rosé (not a saignée), goes to a direct press producing a very light salmon after just an hour and a half. Floral and strawberry. Nice and bright with balanced acidity. Outstanding. 91-93 Points. Unfortunately for us (but I am sure that Gerry likely did not mind), he had already sold out of the Viognier, a wine that captivated me the first visit a few months earlier, so instead, we moved on to a couple Syrahs–the 2008 and the (then) soon to be released 2009. Gerry keeps his Syrah in barrel for three years and then at least another two years in bottle before releasing them–releasing five years (at least) after vintage is virtually unheard of in the wine industry, but Gerry is convinced that his Syrahs need that kind of time. It is hard to argue with the results. 2008 Vineyard of Pasterick Syrah: Retail $48. 487 cases produced. Blackberry and Cassis on the nose with wonderful fruit with some cocoa on the palate. Outstanding. 91-93 Points. 2009 Vineyard of Pasterick Syrah: Retail $48. 400+ cases produced. Mocha and anise on top of a small mound of blackberry. Bigger fruit than the ’08. We just might be in “Whoa” territory. This is good stuff. Outstanding. 93-95 Points. 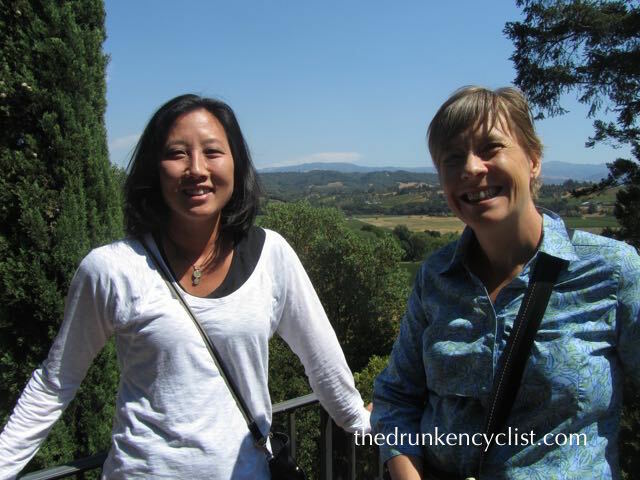 My wife (left) and Diane in the tasting room of the Pasterick cave (I unfortunately cut-off Alexis, on Diane’s left). After a bit of time, we tasted the two again and they flip-flopped, with the ’08 being slightly more impressive than the ’09. These are both incredible wines and I am sure they will be so for quite some time. A couple of days later, I returned once more to the vineyard, this time with my wife and a good friend in tow. We were soon joined by Diane, and their daughter Alexis, who is also the assistant winemaker, in the cave and once again tasted the rosé and the two Syrahs. Then, my world was realigned. I have tasted a lot of wine. I can count on only one hand, however, the number of wines that have caused my paradigm to shift. There was the first, a 1976 Camus Pere & Fils Chambertin, so many years ago in a restaurant in Dijon, that got me hooked on wine. Then there was the 1973 Dom Pérignon a few years ago in my kitchen, that showed me what aged champagne can be. Now, there is the 2008 Vineyard of Pasterick Angle of Repose Syrah: Retail $80(?). 44 cases produced, only available to members of the Wine Club. After Gerry popped the bottle, he explained that the wine is only made in the best years, from a certain one acre block right above the cave. Ray Teldeschi put in the block a few years ago, and it was so much work (having to drill into the rock in order to plant the vines), that Ray stated it would have been far cheaper and infinitely easier to plant 10 acres on the valley floor than it was to plant that single acre. At this point, I am pretty sure that Gerry kept talking, explaining the meaning of the name, the idea behind the wine, and perhaps even his plan for world peace. But I was lost in the aroma of the wine. If you are a wine lover, no matter what type of wine you like, this wine has to be on your bucket list. I doubt I have ever said this but this wine is other worldly: this will likely change your life. I hesitated to taste the wine since that meant I could no longer smell it. I will not try and describe it here since my words would never do it justice. Unworldly is as close as I can come. Incredible. 97-99 Points. As I was trying to sneak another taste of the wine, the conversation then switched to lunch, of all things. As my wife and our friend were discussing possibilities, Diane suggested that we go grab some sandwiches, and head up to the house to eat on the patio. As I was trying to pay attention to the conversation while still contemplating the Angle of Repose, Gerry added that he would bring the rest of the open bottle up to lunch. My wife (left) and our good friend, Leslie on the Pasterick deck. In a couple of minutes I was off to Big John’s Market to buy lunch. About 30 minutes later, I was driving back to the vineyard and up the adjacent drive to the beautiful Pasterick house and its incredible view of the valley. 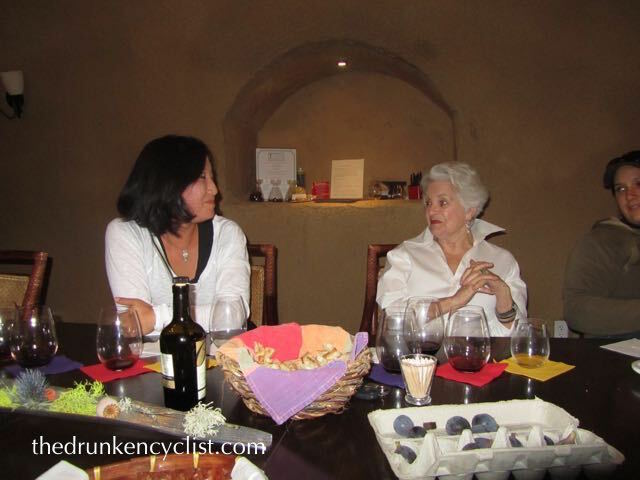 As we started in on our sandwiches, and were waiting for Gerry, who was conducting another tasting in the cave, Diane brought out a bottle of the Viognier—part of her own “personal stash”. I do not drink a ton of Viognier, mostly because I was jaded by a bottle of 1983 Château Grillet that I had back in 2008, but also since there really is not a lot of it available in the U.S.
Well, I might need to re-evaluate. 2013 Vineyard of Pasterick Viognier: Retail $36. 42 cases produced, was only available through the Wine Club, but now sold out. Floral and bright completely lovely. I know I have never had a better domestic Viognier and the only other that might compare was that ’83 Chateau Grillet. Check that, this was clearly better. Outstanding. 94-96 Points. After Gerry came up the hill, we finished off the Angle of Repose, and he also brought up a bottle of his 2005 Vineyard of Pasterick Syrah: Tight initially. Some mocha and game. Wonderful mouthfeel. Great finish. Shows, at least to me, that Gerry’s wines are built to last and age very well. Outstanding. 93-95 Points. Clearly, a memorable afternoon with some great wines and three wonderful hosts. Thanks to Diane, Gerry, and Alexis for a fantastic afternoon. 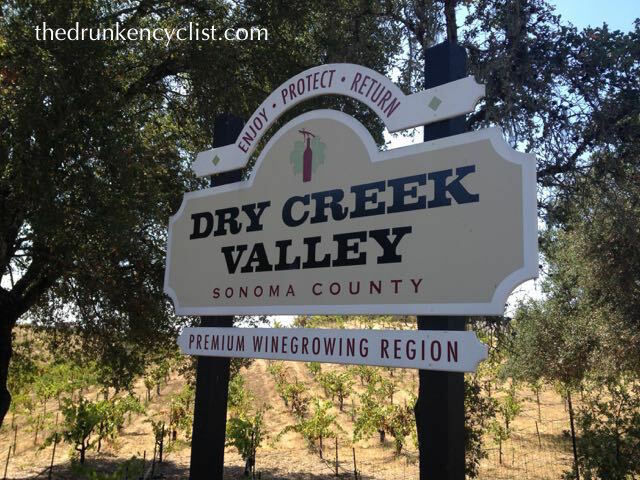 This entry was posted in Dry Creek Valley, Rosé, Syrah, Viognier, Wine, Wine Tasting and tagged Dry Creek Valley, Gerry Pasterick, Healdsburg, Syrah, Viognier, Wine Club, wine tasting. Bookmark the permalink. I am loving the wine I try from Dry Creek. It has all been really good. Great review and another one I must try. Pasterick wines are truly fabulous! Gotta get a hold of that 2013 Pasterick Rosé – looking into membership – hope some cases are still around. Sounds amazing good price – wait? Oh no! It’s not under $10!!! Ok just this once…. I get the feeling you say that quite a bit…. So I take it you sort of like their wines…. I’ll put them on our list for our next visit, you write a powerful recommendation! I think I’ll have to go there just to see that entrance. Excellent picture – and I assume place. Oh, okay, I’ll try some wine.